Scroll down to find links to weather forecast and weekly updates. MOC Weather Reports and images are intended for public information and enjoyment. They are not to be used for scientific research, publications, or presentations. Since March 1999, the MGS MOC has provided almost uninterrupted daily global observations of the Martian surface and weather in two colors (red and blue), at a resolution of 7.5 km/pixel (4.66 miles/pixel), during the early afternoon hours (2 PM local time). The two colors allow scientists to distinguish between different meteorological events, such as dust storms (pinkish-brown) and water ice clouds (white). With over 2.5 Mars years of observations, local and regional weather patterns have become well-known. Many weather patterns have a very strong tendency to repeat at about the same time and same place from year to year--- in other words, the weather is more predictable than for most places on Earth. This repeatability is not surprising. Martian weather conditions are controlled by several factors that do not change much from year to year: seasonal heating from the sun, recession of the seasonal polar frost, and topographic relief. It is therefore possible to use MGS MOC observations made in two consecutive years to generally forecast weather conditions at any given location for an interval not larger than about a week or so. Thus, the forecast---see link below---is based on the observations of martian weather made by MOC over the past two and a half Mars years. 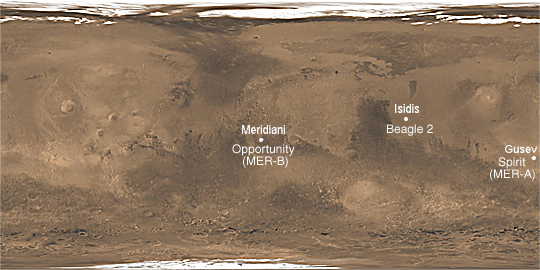 03 - 09 July 2004: MER (Spirit and Opportunity) Sites --Last Weather Report!